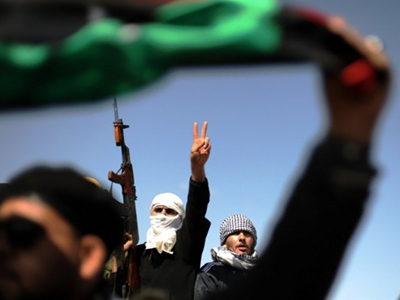 As Libya’s civil war peaks, the US is weighing the role it could play in the chaos. But, many Americans think another intervention would be the worst option for both the US and Libya. 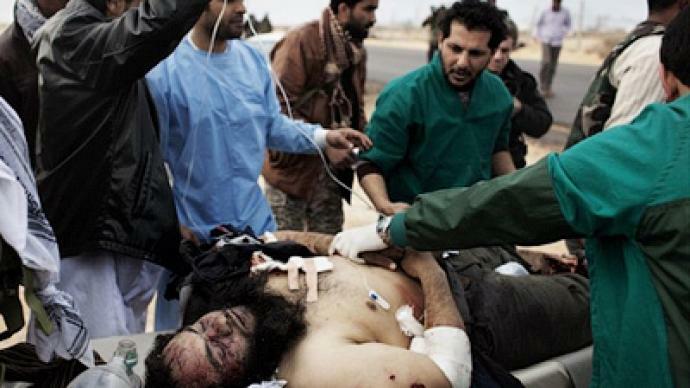 Civil war blurs the outline of Libya’s future, while the US weighs its options on the role it should play in the chaos. 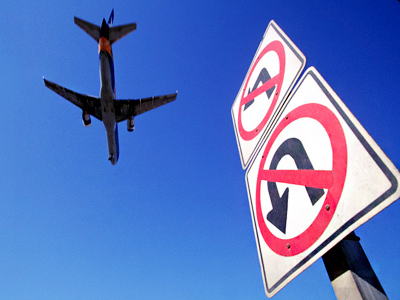 Some war-loving politicians have been pushing for establishing “a no-fly zone”. This means bombing Libyan air defense systems, runways and shooting down Libyan aircraft – an aerial invasion – something most Americans don’t realize, and most Libyans don’t want. “People in the entire region remember what happened with the no-fly zone in Iraq. Hundreds of civilians were killed by the enforcement of that no-fly zone. That hasn’t changed,” said Phyllis Bennis, Director of the New Internationalism Project at IPS in Washington, DC. Some high-ranking officials have taken it so far as to joke about an attack on the African country. But is Libya any of America’s business? And why not let the Arab world fend for itself? “There is absolutely no possible justification for the U.S. or even the EU to get involved in Libya. There is nothing in their charters, nothing that would justify. It’s a civil war, in a different country, in which the details are very murky,” said journalist and historian Nebojsa Malic. But could America be a hop, skip and a jump away from another war? 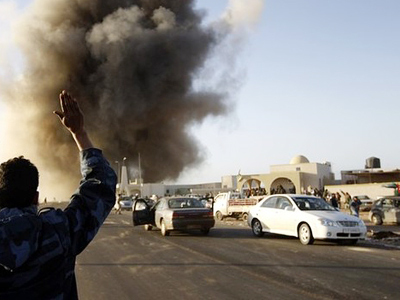 The White House is now saying it will wait for the UN to lead the way in dealing with Libya. But with a habit of getting knee-deep into other nations’ affairs, will America be able to resist the temptation? “This could be a re-run of Iraq. This could be a re-run of humanitarian imperialism, and very, very dangerous. 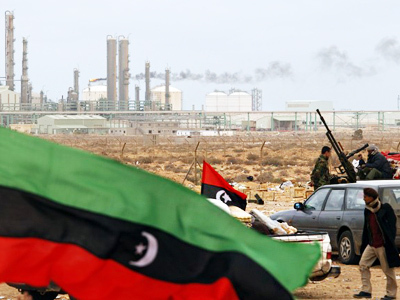 There is nothing for the West to do in Libya,” said Asia Times correspondent Pepe Escobar. Despite warning signs flashing, some experts believe history is about to repeat itself. Iraq and Afghanistan, they warn, sucked the U.S. much further into war than first anticipated. “The definition of insanity is doing the same thing twice and expecting different results. In the case of the U.S. it would be doing the same thing dozens and dozens of times and trying to get different results. The U.S. has not won a war decisively since the end of World War II”, said editorial columnist Ted Rall. Upholding human rights and establishing democracy have often been pretenses for America’s invasions. 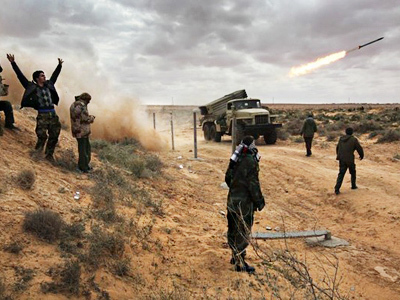 Officially, these are also the main concerns for Libya, but the underlying reality is said to be very different. “This is about oil. And if the U.S. could go in militarily, and claim to be going only for humanitarian purposes, the American people will buy it,” explained media critic Danny Schechter. Some also see hypocrisy in the calls for humanitarian intervention. “Nobody brought this up during Rwanda, but of course Rwanda didn’t have oil,” said Rall. With two other American wars being fought in the Muslim world, death tolls continue to rise. Apart from the human cost, the U.S. is running up a huge warfare tab. “Considering the fact that we have 54 percent of federal tax dollars going into defense and into the destruction of Iraq and Afghanistan – you have to really wonder how crazy this country is,” said Rall. Questions have also been raising regarding the lack of will from the American people to foot the bill. “Both the Europeans and the Americans are facing huge budget deficits, military overstretch. It’s going to be very hard to explain to the people why they can’t have their pensions, and why they are losing their jobs, but there is enough money to throw away on a military intervention in a country that’s far away and is minding its own business,” said Malic. For now the US seems to be taking a wait and see approach hoping the United Nations will lead the way. But with the US unsanctioned invasion of Iraq fresh in mind, many fear, if support within the international community is not found, the US would act regardless. 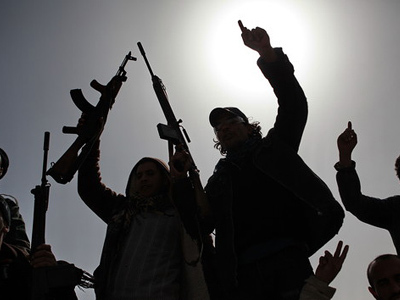 Former Reagan administration official Paul Craig Roberts said Libya is a test of the Egyptian revolution. “One would think that if Egypt has really had a revolution they would come to the aid of their fellow revolutionaries,” he remarked. 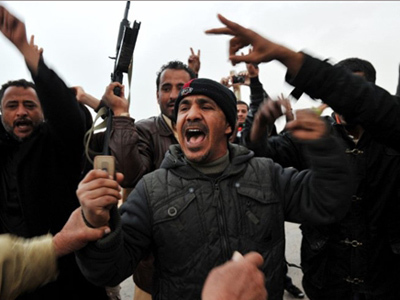 In the past 24 hours, there has been a shift in Libya, with government forces strongly pushing back against protestors. 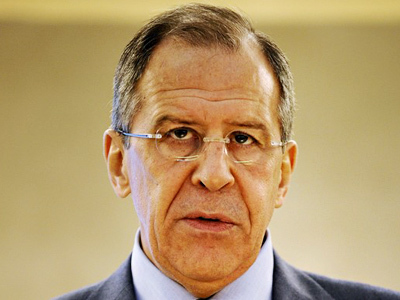 It is unlikely the US or others would enter unilaterally. However, with the permission or organization of the UN or NATO intervention by the US or European powers like France is possible. In addition, Most Americans have no desire to get involved in further international conflicts and support decreasing US expenditures overseas in defense programs. “I don’t think the Libyans want to be liberated by the Americans,” Roberts said. 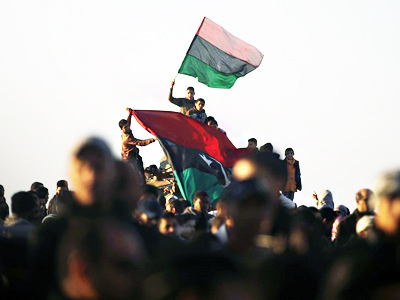 He explained the people of Libya want to gain their own independence through revolution and could most benefit from fellow revolutionaries in neighboring states – like Egypt.